San Francisco Giants: Who Will Step Up in Brandon Belt’s Absence? The San Francisco Giants are facing some serious adversity. Brandon Belt fractured his left thumb after being hit by a pitch in Friday’s game against the Los Angeles Dodgers and will be out for at least six weeks. Where does this leave the Giants? Belt was having a breakout season. He is currently tied for third in the National League with nine home runs, just behind Giancarlo Stanton and Troy Tulowitzki. 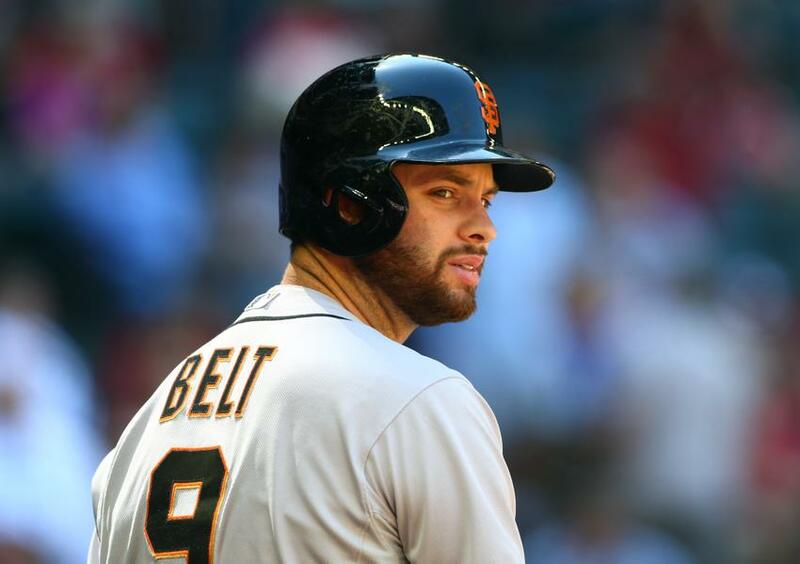 Belt is a heart-of-the-order hitter for the Giants, so they will certainly miss his offense. The Giants will greatly miss his defense as well. He’s an elite first baseman defensively. He has great instincts, and he can make tough plays because of his height and quickness. So who will step up for the Giants in Belt’s absence? The player that needs to step up is Michael Morse. He is already having a great season. He’s hitting .264 and has eight home runs, 24 RBI, and a .520 slugging percentage. Morse is going to have to dig deep and step up even more though. Morse told Alex Pavlovic of the Bay Area News Group that he’s versatile and is fine with playing first base. Buster Posey and Hector Sanchez could occasionally get starts there too, but Morse will start most of the time at first base. Bochy decided this was the best move, even over bringing up Adam Duvall from the Fresno Grizzlies, because Morse has the most experience at first base, and this move will give the Giants more speed in the outfield. Morse will most likely not be able to match Belt’s defensive prowess, but more importantly, the Giants need him to be consistent at the plate and continue to hit for power and get hits with runners in scoring position. As for left field, Bochy has said that he will go with the hot hand, which is Tyler Colvin right now. In his first start with the Giants and his first game at AT&T Park last night, he hit a home run and triple. He had been hitting well in Fresno recently, and it seems as if he’s brought that confidence at the plate with him into the big leagues. Bochy told Pavlovic that he wants to see how Colvin does with more playing time. In addition to Morse, Colvin will also have to step up with Belt out. This is the ultimate opportunity for him to prove that he belongs in the big leagues. He needs to stay confident, and hopefully for him, that will translate into consistency. The Giants could really use a stronger bench. If Colvin can be consistent and have good at-bats, he might get a chance to stay with the Giants even after Belt comes back. Colvin has an opportunity to get consistent playing time at the big league level with Belt out, and he needs to take advantage of it. In addition, Morse has already helped bolster the Giants’ offense so far this season, but he will be called upon even more. Morse will potentially be the key to the Giants’ success in Belt’s absence. ← San Francisco Giants: Can They Keep the Power Bats Hot?